Add all of the ingredients for the tart crust to a mixing bowl and stir until a sticky ball forms. Distribute crust mixture among a 12-hole muffin pan and press firmly into the bottoms and sides of the holes, creating thick tart crusts (Note: You can also use ten 2-1/2 inch tart pans or one 10-inch springform pan). Place muffin tray in the refrigerator while youre preparing the pie filling. Add all of the ingredients for the pie filling to a blender or food processor. Blend until completely smooth. 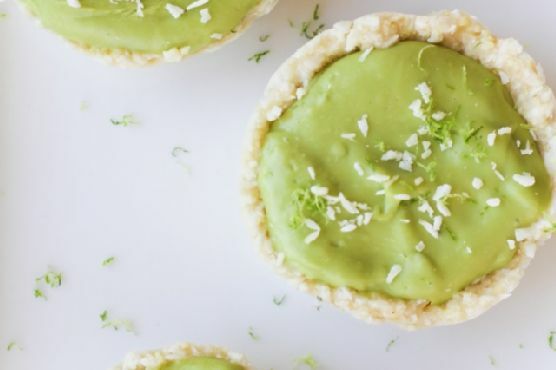 Pour the key lime pie filling into the prepared muffin pan and use a knife to smooth out the mixture. Freeze for 30 minutes or refrigerate for at least 2 hours. If using a muffin tray, run a paring knife along the edge of the crust and the muffin pan in order to release the tarts. Serve with unsweetened shredded coconut and lime zest. Cream Sherry, Moscato d'Asti, and Port are great choices for Tart. A common wine pairing rule is to make sure your wine is sweeter than your food. Delicate desserts go well with Moscato d'Asti, nutty desserts with cream sherry, and caramel or chocolate desserts pair well with port.